DayStar Solar Scout 60mm - Chromosphere 0.3-0.5A is a 80mm diameter solar telescope with 0.3-0.5A bandwidth H-alpha filter to achieve maximum performances in Sun observation and photography at an affordable price! The large diameter combined with the narrow bandwidth allows you to see or take pictures with exceptional detail of many phenomena such as solar prominences, sunspots or filaments. DayStar Solar Scout 80mm - Chromosphere 0.3-0.5A solar telescope is composed by: quality achromat doublet 80mm refractor, carbon fiber solar telescope, helical front-end focus with fine precision, environmental hard case, interchangeable Daystar Quark, 'Solar Bullet' finder, Vixen/photo style mounting foot. 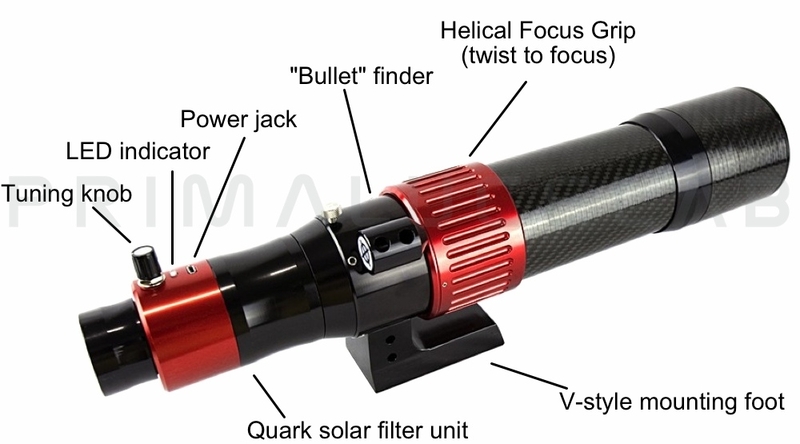 Robust and precision accuracy: helical front-focus can't slip and does not turn the eyepiece.